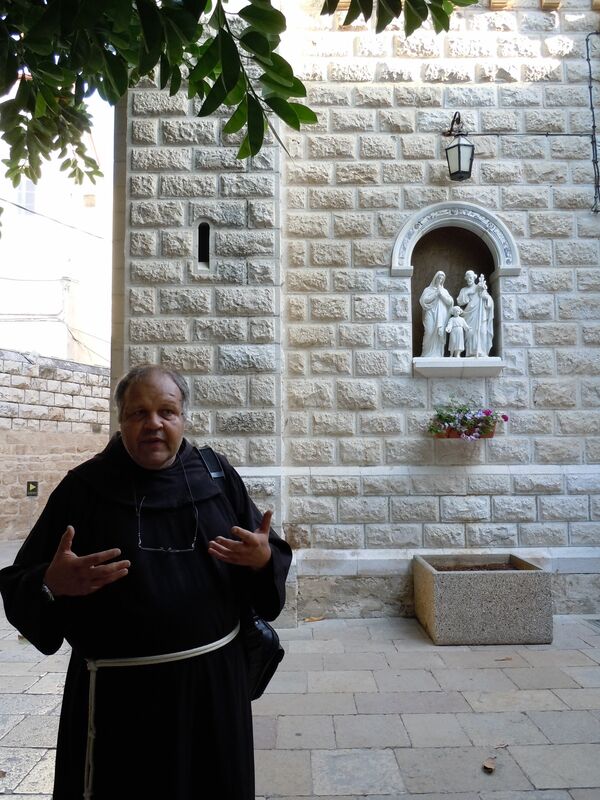 Franciscan guardians of Holy Land shrines launch new website :: Catholic News Agency (CNA). In Christmas messages, Holy Land’s Catholic leaders call for peace on earth :: Catholic News Agency (CNA). A little over ten years ago I made my first Holy Land Pilgrimage. I concluded that it would be a once in a life time trip. Never say never. The opportunity presented itself to go on another pilgrimage in late October with the priests of my parish and a few parishioners. We were joined by other family and friends that wove itself into the group with six degrees of separation — practically everyone knew someone through some association. The trip was led by Franciscan Pilgrimages. The chance to travel among the companionship of friends and many other Franciscans was an easy sell for me. What has not come easy is documenting my impressions in written form. Not only did I fail to take a writing journal, I managed to misplace my writing pen for a day. Last night I reread the excerpts from the journal of my first pilgrimage — the excerpts I posted here during Lent 2009. This trip was different — the Toys R’Us and McDonald’s were no surprise. I knew some of what to expect and yet some things had changed in ten years time. This time I was more inner reflective and less outwardly emotional. Things that moved me easily to tears ten years ago have aged and matured to a depth beyond tears. I watch — I listen — I absorb everything — I’m not distracted by the act of immediately committing my thoughts to paper. I’m still working on those thoughts — I did make random notes of things I don’t want to forget. I’m more conscious of the social and political issues. There was no wall around the occupied territory ten years ago. The calls to prayer from the minarets — I don’t remember from before. 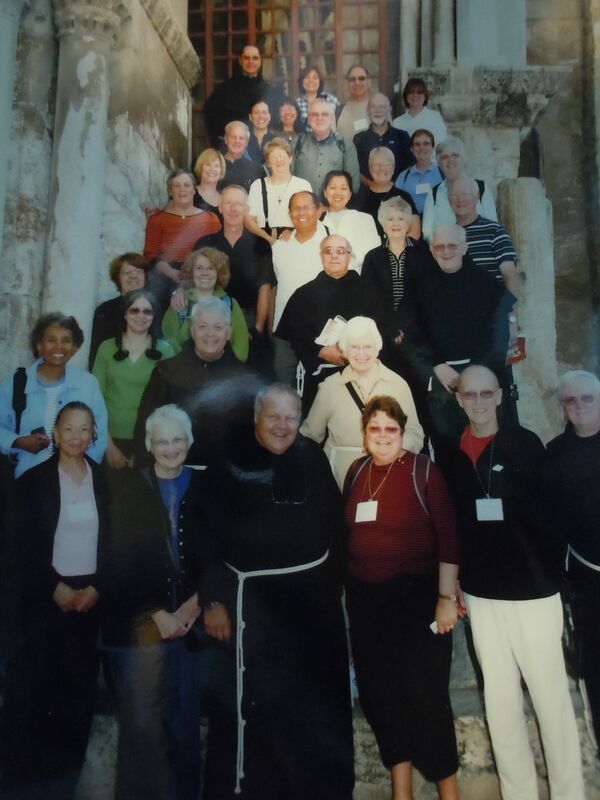 Franciscans in the Holy Land have it — location. Our journey began in Nazareth, where we stayed at their Casa Nova Nazareth — directly across the street from the Church of the Annunciation. A location that was just a brief stop on a day trip ten years ago became the view I saw outside my bedroom window for three nights stay. Our third night gave an opportunity to attend a holy hour at the Grotto of Mary. In Bethlehem we were to stay at their Casa Nova Manger Square — next to the Church of the Nativity. A last minute change had us at a nearby hotel instead. But, we had lunch at the Casa Nova Manger Square and spent quality time there. In Jerusalem, we stayed at their Casa Nova that is just a short walk from one of the entrances to the Holy Sepulcher Church. I enjoyed the ‘urban-ess’ of this trip — much more time walking among the streets of the cities where we lodged. It was difficult to return to work the first few days — wondering how my 9 to 5 in a cubicle was contributing to World Peace. 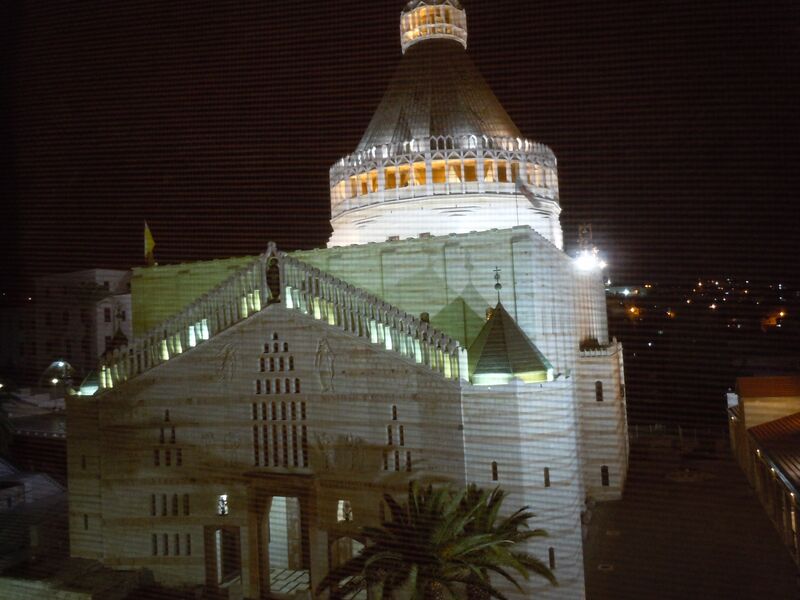 Continuing with Day 8, and the final installment, of excerpts from my February 2000 Jubilee year Holy Land pilgrimage journal. Our day begins with early breakfast as we proceed to begin the Stations of the Cross. In groups of three, we take turns carrying a cross between each station. Father read the stations as we pause at each one. 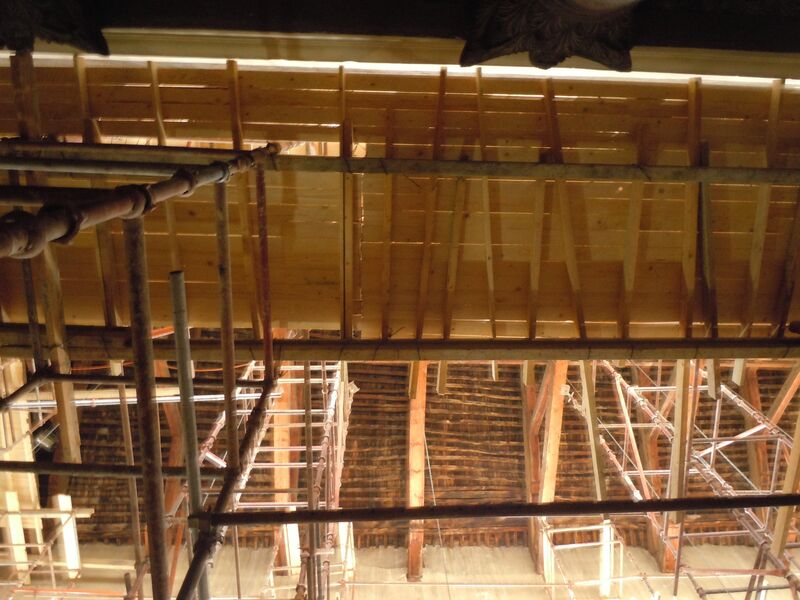 The Holy Sepulcher Church is built on top of Calvary. We are invited to go individually and touch the rock of Calvary on which Christ was crucified on the cross. I am crying. Wiping tears from my eyes with my hand, I touch the stone. My best offering at this moment is my tears. Next, we touch the slab of His anointing where I place my grandfather’s medal to be blessed. We are then invited around the empty tomb as Rula gives us all candles. She lights a candle from the tomb and lights Father’s candle. We light all our candles. On the Saturday before Easter, Rula says Christians have an ecumenical candle ceremony in the church. We are asked to keep our candles and light them on Holy Saturday this Easter. Our Mass today is in the Holy Sepulcher church. I have the first reading here and it is very emotional for me. I think of the song “The Old Rugged Cross” which begins “On a hill far away…” I’m thinking, today that hill isn’t so far away. It’s in this very place – this church. The reality of this is incomprehensible to me. We travel out to Emmaus to visit the Church of the Breaking of Bread. We walk a short piece of old Roman road that is located in the enclosure of the church grounds. Our last site of the pilgrimage is St. Ann’s church. We depart for the airport at 3AM to head for London. I’ve not slept at all this night. I’ve been home several weeks now and still can’t believe I was really there. I read scripture now and so many places come to real life for me. I still get emotional and cry, if I think too much about it. I miss the routine of community Morning/Evening Prayer and Daily Mass. The places in scripture I’ve only read about all my life have become realities. I feel I’ve been re-baptized in the Spirit — like a candle that is redipped many times to reach its fullness. I feel a special grace has been given to me. Every step I take reminds me I walked in Jerusalem — drifted on the Sea of Galilee — knelt at His manger — strolled down the Palm Sunday route — felt His agony in the Garden and in the dungeon — carried the cross — and stood on the place called Mount Calvary where Jesus died for me…..
How fitting that I close my series of journal exerpts on Palm Sunday – the beginning of Holy Week. Just this afternoon, I led our RCIA group in the Stations of the Cross. I still cry. My memories are powerful and make themselves present. The Christian practice of making a Holy Land pilgrimmage dates back to early medieval times. During periods of time where access to the Holy Land was closed, it became a practice to errect replicas in churches. On November 21, 1342, Pope Clement VI entrusted the Holy Land to the Order of Friars Minor. Read the Bull. A lot of information on the history of this can be found on the Custody web site. Resulting from this was that Franciscans were given exclusive permission to build Stations of the Cross. Special indulgences were given to pilgrims praying the Stations in Franciscan churches. Below is a small quote from a very good article on the history of the Stations of the Cross. I made my pilgrimage in February 2000. By the Summer, there was again unrest in Israel – the sort that affects tourism. On April 2, 2002, the Church of the Nativity in Bethlehem was taken in a 38 day siege. Franciscans were barricaded inside the church. I was stunned. I watched the endless Cable live news reports. I cried. What had changed for me is the fact I had been there a little over a year ago. It was news like that written in the quote below that was piercing me. My pilgrimage made this very personal to me. I gained a new respect and understanding for all the Friars who greeted us in all the sacred sites. As we begin Holy Week, know the Way of the Cross and from where we have come.